The Chess Drum’s Daaim Shabazz had a chance to chat with Bahamian chess pioneer Warren Seymour. He had finished directing the 2011 Bahamas National Open won by Yan Lyansky. In the 27-minute interview, Seymour talked about his chess beginnings in 1954 and his learning the game by picking up a book in the library. After going off to England for schooling and was able to reinforce his passion for the game. Seymour remembers quite a bit from the humble beginnings of the federation. The Bahamas became a member of FIDE in 1974 and participated in a number of regional tournaments in the Caribbean. A pivotal point in the development of Bahamas chess was the 1983 trip to Chicago for the 1983 World Youth Team (under-26). Seymour reflects on the history of Bahamas chess in an informative interview. 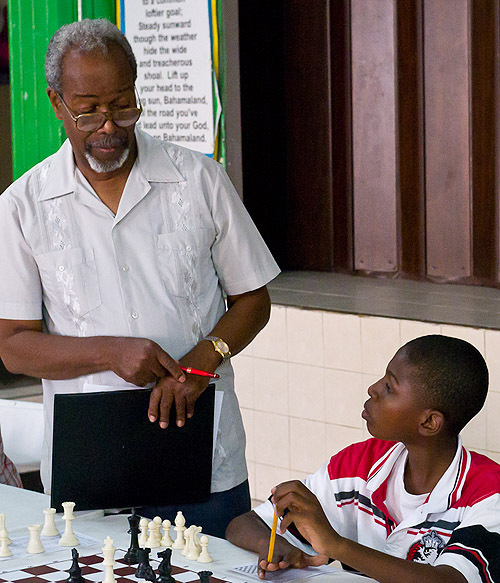 I am glad to see that our Bahamian friends are putting chess squarely back to where it belongs – first place! I had the pleasure of meeting Mr. Seymour several years ago after I had literally walked a couple of miles in Bahamas trying to find him from school to school til I found him teaching (on a Saturday at a school) a bunch of enthusiastic children who were playing blitz, bughouse etc. We spent some time by his home and he regaled me with tales of the Bahamian chess history etc. (including when the national championship had pride of place and was duly recognised by even the head of state!). He came back with me to my hotel where we chatted further, played a couple of rapid games etc. I am glad that you had the oportunity to visit the country and chill out with the members of the chess fraternity! We here in Jamaica wish all the very best for Bahamian chess (especially with participation in international events) and hope to see several of their players in Jamaica in the near future. Warren Seymour giving words of wisdom to Giovanni Robinson. Hope you re doing well do glad to see you are blogging.I am getting ready for a major chess camp during the summer looking forward to your support as usuall.Willl get in contact with shortly. I listened to the entirety of your interview with Warren Seymour and it reminded me how I met him. He was transferred in 1984 or 85 to the high school I attended. Mr. Seymour quickly started a chess club and we won the high school chess championship two years. 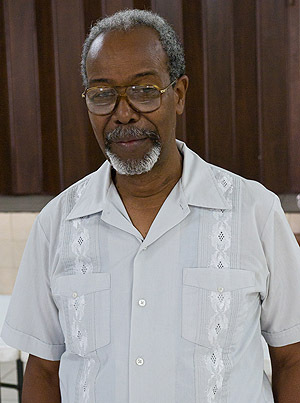 During 1985 he was the coach for the Bahamas’ team that participated in the Caribbean Chess Festival which was hosted by the Jamaica Chess Federation. The team consisted of Antoinette Seymour, Juliette Storr, Troy Pedican and me. Antoinette won the Women’s Championship. It was at that tournament where I first met Corbin, Buckmire, Denny and Amanda Tudor of Barbados. I also recall meeting Faircloff from Jamaica, Brooms of Guyana, Beharry and Ramsign of Trinidad and Tobago. That tournament was the most memorable time in my chess playing career to date. If it was not for Mr. Seymour’s commitment to Chess in The Bahamas, it is unlikely that I would have had that experience. Finally, Mr. Seymour has been an invaluable resource to me during my presidency of the BCF. I can comfortably say that with his willingness to provide advice, we would not have been able to accomplish as much as we have. In closing Daaim, I wish to say “Keep the drum beat going!” because it has been and continues to be a source of encouragement and information for the chess playing community in The Bahamas. on 12 Feb 2012 at 1:02 pm5 The Chess Drum » Blog Archive » Happy 11th year to The Chess Drum!